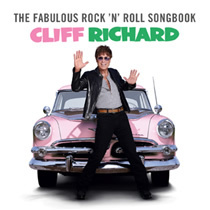 Cliff Richard, the UK hit-maker, releases his 100th album ‘The Fabulous Rock ‘n’ Roll Songbook’ on 11 November 2013. This new studio album of 15 great rock ‘n’ roll tracks was recorded live at the Blackbird Studio and The Parlor in Nashville, Tennessee, and is Cliff Richard’s tribute to the greats of rock ‘n’ roll who inspired and influenced him, such as Elvis Presley, Little Richard, Chuck Berry and Buddy Holly. The Fabulous Rock ‘N’ Roll Songbook is released on 11 November 2013 on Rhino.